Muir Stratford was one of the directors who saw it all. He had been on the board in the days of Jim Bonser. He saw Elton John arrive in his flares and platform boots. He went on the incredible journey from the Fourth Division to the top, to Europe, Wembley and beyond. And then he witnessed the ill-fated recruitment of Graham Taylor’s replacement. I visited him at his home in Sarratt and listened as he gave me an insight into how things looked from the board room. We started at the beginning as he told me about his earliest days watching Watford. I first went to a match, with my father, right at the end of the Second World War, in 1944, before the Football League restarted. It was Watford v Charlton, and Watford won 3-2. I began to go fairly regularly in 1947 but I went to boarding school so I was away for quite a bit of the time so I only used to see matches in the holidays. I got enthusiastic about it and went to every game that I could. I lived in Hatch End. There was a chap in Hatch End who knew Jim Bonser [a Watford director and later chairman] and did some work for him, and through that I got to meet Jim Bonser. I was working in the City. I started working in the City in 1956 after I’d done national service. I got to know Doug Broad [another Watford director] very well. I would travel into London for work, as would Doug, and we used to meet on the train. Doug was on the board by then and we became very good friends. Once I showed an interest in going on the board, Doug was desperate to get me on the board, but with Jim Bonser that was not easy. First of all, you had to be a yes man. Dennis Mortimer who subsequently became the chairman of Luton Town, and I, were very nearly put on the board at the end of the Sixties. I still think one of the reasons Ken Furphy [the manager] went was because Bonser wouldn’t put anyone on the board to put any money in. I put in a small amount of money, well in those days it was quite a lot of money, as an interest-free loan. Ken will say Bonser refused to have us on the board, and Dennis Mortimer would have put in a lot more money than I did when I eventually went on the board. That was why Ken went to Blackburn Rovers, because there was nothing more he could do. I eventually went on the board in September 1971. George Kirby had just been appointed. I got on very well with George. He was a very nice guy. He couldn’t get on with Bonser, but that wasn’t unusual. But Bonser wouldn’t provide any money and we got relegated. We did manage to turn things round. We had Mike Keen between Kirby and Graham Taylor. What was Jim Bonser like? He wasn’t terribly popular with supporters was he? And he’d been chairman for many years, from 1958 to the mid 1970s, I think? Bonser was a self-made builder. No one could ever doubt his commitment to the club but if you didn’t agree with him, well, basically he was a one-man show. His board was a bit of a joke. Doug Broad and Jim Harrowell both had good knowledge of football, which is more than Bonser had really. Bonser came from Preston. His heart was in the right place. He got on the board in 1952 when the club was in desperate straights and later became chairman. No one should knock his contribution to the club although he was a difficult person to get on with and he wanted his way. In 1971, and within a year of me going on, Broad came off because he’d had enough. He and Bonser didn’t really see eye-to-eye at all. How did Elton get involved then? Elton was around. People were aware he was a supporter. He used to watch the matches, so people knew him. He appeared on the scene [in an official capacity] in 1974 as a vice-president. I was on the board before Elton. He took over as chairman in 1976. What was he like in those days? Totally flamboyant and larger than life. His interest was complete. There’s never been any doubt about his commitment. His passion and enthusiasm for Watford was total but he didn’t know how football operated. He made no bones about it, he didn’t know how things worked. So how did Elton and the board come to appoint Graham Taylor in 1977? You sacked Mike Keen towards the end of the season, so this is about March or April 1977? That’s right. I felt for Mike but Elton was going to put in some money and I think we all thought we needed a new manager to take us forward. So how did it come about that Graham Taylor was recruited because I gather Elton had already approached Bobby Moore? We got him in the middle of the summer. The driving force came from Geoff Smith and myself – although I am not trying to take undue credit here – but you’re right, we did have to push for Graham. After matches the managers used to come into the boardroom. We had a corner of the boardroom we used to call The Kremlin, where only the directors could go. And we’d meet the managers from the opposition and have a chat. You don’t have to spend too long with people to get a feel for them. Graham had come here a few times with Lincoln and had left a good impression. Geoff and I were determined that we had someone who knew the division. There was no point getting one of these names to come down to the Fourth Division. Graham knew the lower divisions and had been very successful with the Lincoln team a couple of years before. We had a tip-off that made us think Graham was interested, by a mutual friend who had met him on a cruise, who was a Watford supporter. [When I mentioned this to Graham, he couldn’t recall going on a cruise, but thought it perfectly possible he’d spoken to a Watford supporter at some point.] Geoff and I were working on that sort of line with the board. Elton, I have to say, had never heard of Graham Taylor. Nothing wrong with that. Not particularly surprising. We’d been to the grounds and met the managers and although he had travelled a bit with the club he didn’t know them as well as we did at that point. Did you feel before then that Elton wanted to take the lead and run it on his own, then? I wouldn’t say that. I think Elton knew he needed a board of directors that would run the club and although he was a young man, a very wealthy man, he had ambitions to take the club on. He didn’t do it in a showy way but he made it clear that he wanted to develop the club in every respect and make it in a First Division club. He had the money to do that but he wasn’t daft. He wasn’t going to keep spending silly money, he wanted to do it sensibly, and in a way that would enable the club to survive at the higher level. He didn’t want to do it for the sake of doing it, his ambitions for the club were absolutely genuine and they were from the heart. But I think he maybe looked round the table and wondered what he had with him. Perhaps that was an important moment because it reminded him we all had something to offer. The board was tremendous from day one. Elton was the chairman, Geoff was the vice-chairman, there was Harrowell and there was me, Vic Lewis, Muff Winwood came on later, as did John Reid, Elton’s manager. John was very keen on football but he never got deeply involved other than looking after Elton’s interest. Graham says he was appointed to run the club, so how did he do that without stepping on the board’s toes, so to speak? Elton used to say, ‘We are paying Graham to do this, so let’s allow him to do the job. If he fouls it up, we can sack him.’ [Laughs] I’m joking but there’s a serious point to this. We had hired Graham to do the job, so there was no question of us interfering in the things he was doing, especially not the team matters. Elton was of the opinion that there was no point being over Graham’s shoulder every day. We could run the club, offer guidance and support and be the board of directors and Graham would run the club on a day-to-day basis, which he did. Did he inspire confidence from the start? He was a young man but he knew his own mind and he was unbelievably thorough. He told you what he was going to do, and he did it. If something didn’t work, he’d say, ‘Well, that didn’t work, did it,’ and he’d move on and do better next time. He wasn’t trying to pretend he never made mistakes, and I think people recognised that and trusted him because of it. He only ever tried to do the best and he knew that the game of football offered no certainties. You could be the better team on the day but still lose the game. That can happen from time to time. If I had to boil it down to anything, I would say that he never, ever tried to pull the wool over people’s eyes. He was successful more or less immediately? Quite soon after he arrived, he appointed Bertie Mee as his assistant. Graham wanted someone experienced to hold his hand, if you like, that’s how Bertie came in. And I always feel Bertie was the most important signing Watford ever made. He was a senior man, experienced, knew the game and people respected him. Then Eddie [Plumley] came, and it turned out to be a wonderful team. But Graham was in charge? Graham ran the club from top to bottom, absolutely. He was unbelievably good. I remember once I was on business down in Bath and I got back to the hotel after going out to dinner and there was a message to ring Mr Graham Taylor. If he was signing anyone he used to ring the directors personally. Anyway, he said, ‘Dennis Booth is signing tomorrow.’ He ran the club but his communication skills were excellent. Graham, Bertie and Eddie ran the football side and we provided the support. What was Elton like at that time? At the beginning, Elton was extremely flamboyant. He always said he was the only chairman who had a manager older than him. But in those early days he was very flamboyant. At Oldham once, Ken Bates wouldn’t let him in the boardroom ‘dressed like that’ so none of us went in until they let him in. The great thing for Elton was that this was the only place he came where he met ordinary people who weren’t chasing him around. He was a pop star and everywhere he went, and still does, he gets pursued by people, there are hangers-on. At Watford he could meet ordinary people and talk about ordinary things and at the time I think that’s exactly what he needed. He could come to the football club and none of us pestered him about anything. We talked about football and the business of running the club and yes, we might discuss whether he was going on tour, or if he’d be recording a record but it was in the context of what that would mean for the football club. Did things change when Elton took over? It was interesting because one thing that happened under the Bonser regime was that there was a ‘ladies’ room’ where the directors’ wives went. Mrs Bonser ran that room. And my wife will tell you that if you wanted a cup of tea you had to get down on bended knee to get one. We did away with that and opened up the board room and ladies and children were welcome in the board room. We had our little Kremlin, as we called it, if the directors just wanted to have a quiet word about club business. It was an ante room and we would invite the visiting manager in for a quiet chat but in general we opened everything up. Did it help that Graham did well right from the start? Of course. I sometimes wonder what would have happened if, say, we didn’t get promoted that first year [1977-78] but I honestly think we’d have taken a deep breath and tried again and Graham would have done it the next year, because he transformed the place. Elton was on board, the board was very united. Suddenly we get promoted from Four to Three to Two and everything is going swimmingly. But none of us were going into it on a wing and a prayer, certainly not Elton and certainly not Graham. We had a 10-year plan. Five years to get to the Second Division, then five years to get to the First, but we made it to the First in five years. What was it like when you got to the First Division? The club had to keep up with the team. There was an awful lot of work done to make sure the club could go to the First Division and be competitive. The ground had to be completely overhauled. A lot of work was done, even if it took a long time to get that stand built [referring to the Rous Stand, now Graham Taylor Stand]. The first year we were in the First Division I think a few of us thought we may not be there terribly long. That wasn’t that we were not confident but we didn’t know. We should have known better. [Laughs] I went to quite a lot of away games. Geoff Smith never missed a match. In that debut First Division season I went to every first team match bar one, which was Norwich away, because I was on business in Cyprus. It was a real eye-opener because you went into the boardrooms of the country and found such a tremendous variation. Everton were tremendous. We got on great together. At Liverpool, under Sir John Smith, they gave the impression, why do we have to play people like Watford? It was the same in London, going to Highbury was a total pleasure, going to Tottenham was completely the opposite. Man City under Peter Swales, that was another one, he resented us going there at all, I think. Ipswich we got on well with because Bertie had always got on well with them. We always tried to welcome the opposition directors exactly the same, whoever they were. We started having lunches for the visiting directors in about 1981 or 1982. Do any games stick in the memory? The European games were fantastic. To have been on the journey from the Fourth Division to the First Division was wonderful but to see the club compete in Europe was beyond anything we’d thought of. I know Elton says he’d wanted to get into Europe right from the start but I don’t think anyone really thought that was on the cards until suddenly it was! I went to Kaiserslautern and Prague but I didn’t go to Sofia. I couldn’t go for some reason. But Three Counties Radio asked if I’d go and sit in the studio at Dunstable. I drove to the City, got stuck on the M1 and listened to the end of the game on the radio, I never actually got there. The FA Cup final, of course, was another day that hasn’t been repeated. To get there was tremendous. Losing was very disappointing, but we lost and really, on the day, deservedly we lost. I am still not keen on Andy Gray, it has to be said. It’s a shame he’s on Sky every week as a reminder of that second goal! But to have got to the FA Cup final – at that time it was the most watched football match in the world, I should think. As the club got bigger, did it change at all? I don’t think so. I think that’s one of the things we’re all proudest of. We never forgot where we’d come from. When lower division clubs came to Vicarage Road in the cup we didn’t look down our noses at them, not at all. We recognised that there were 92 clubs and they all played a part. When Rochdale or Crewe visited, we remembered that we had been with them a few years earlier. I do remember the big negotiation to hold on to John Barnes in about 1984 or 1985. I remember Bertie was very friendly with John Barnes’s father. John was coming up to his 21st birthday and we decided to give him a very big contract leap, but when I tell you it was to about £25,000 a year that tells you what finances were like in football at the time. That was a lot of money for Watford but today it looks like nothing at all. We had a very, very good rapport with the players. I can’t think of any players who were particularly difficult. Perhaps Mo Johnston caused the manager one or two headaches but we got him for a song, as it turned out, and he was a terrific player. We had some great Christmas parties and, I know it’s a cliché, but it really did feel like a family. How much say did the directors have in which players joined? Graham would probably have discussed most of the signings with Bertie and Elton. We wouldn’t have been involved in that as a board of directors. The playing side was totally theirs. You could make suggestions but basically they were the professionals, they were paid to do this job and they did it bloody well. But we were a very united board, until the famous day. This to be fair, is the only thing I will ever hold against Elton. It was the only thing he ever did on his own, without consultation, which was to go off after [Dave] Bassett. It seems slightly contradictory to me. On the one hand it seemed like Elton’s interest was waning, or that other things were taking his time and attention away from the club, perhaps, but on the other, he was very enthusiastic about recruiting Graham’s replacement. Firstly, had you sensed his involvement was waning in the months leading up to May 1987? Yes, I think that’s possibly true. I don’t think his love of the club, or support of it, or anything like that was fading, but he had a lot going on in his life at that time. He’s a complex character, he can get very fired up and can get very depressed very quickly. I think we saw that from Elton and we also saw that the football club, to a degree, was a place that Elton felt he could be himself, away from the press intrusion and all of that sort of thing. To keep Elton’s enthusiasm for one thing going for 10 years was pretty good. I think he was disappointed – we were all disappointed – that Graham decided he was going to move on but I think it was inevitable that Graham would move on eventually. He’d done a decade and he was ambitious. He wanted to test himself somewhere else. He’d been brilliant at Watford, but if he was to be England manager one day, he had to show he could be brilliant somewhere else. And he showed that [at Aston Villa]. Do you think Graham sensed Elton was losing interest? Let’s not get the wrong impression here. Elton had given a lot for many years. The club was established in the First Division but all good things come to an end. Could Elton stay for ever? No. Could Graham? No. I can’t tell you – and I have spoken to Graham a lot – to what extent Elton’s moving away from full enthusiasm affected Graham’s decision to go. Possibly deep down everyone felt it was time but we were like a family and no one wanted to admit that out loud. I mean, who wanted to say what they were thinking first? I think Graham felt he had done as much as he could do. We were all sorry to see him go but I think for his career it was the right thing for him to do. When did you realise Graham was going to go? It was right after the end of the season. Graham talked to me and Geoff Smith about it. One was going to be sad about it but being honest about it, it was probably right for Graham. He had done a tremendous job and it was probably the right thing to move on. I don’t think anyone would have wanted to stand in his way. I think the first I knew of it was when I read it in the paper. I remember Geoff and I were talking to each other on the phone about it. Elton met Bassett with Muff Winwood and before we knew it, he was the new manager. Did you object to the idea of Bassett? I mean, he possibly looked a good fit. Or was it the way it was done? It wasn’t so much Bassett it was that this decision which was not taken by the board, but was taken by Elton. Okay, Elton was the chairman and to all intents and purposes it was his club, but it was not how we had done things. We had always spoken as a board about big decisions. One of Bassett’s conditions was that he brought in his own men, and I think that was the biggest mistake made. It is quite interesting because Bassett makes no bones about the fact he had an enemy in the board room. Well, in fact he had two, but I’m the only one he mentions! The other was Geoff. We were not keen on Bassett. He didn’t produce much in the way of results and things unraveled quite quickly. Bassett and I are on reasonable terms now. He may say otherwise of course. [Laughs] About four years ago I was the president of the South West Herts FA and they had a centenary dinner, to which we were invited. Low and behold, who was the guest of honour, but Dave Bassett, and who did I find myself sitting next to, well Dave Bassett. We went up to each other to say ‘Bygones be bygones’ and we shook hands. What was it about Bassett that you didn’t take to? I think if he’d kept the staff, maybe things would have been better. Let’s face it, whoever followed GT was going to have a difficult job, undoubtedly, but I think it would not have been half as difficult if the staff had been left alone. Steve Harrison, John Ward, Billy Hails, Roy Clare – these were people who knew the club inside-out. You’d have had a new manager but the staff would have known the players, but if you have a brand new broom coming in and you sweep everything away it will be difficult. Wasn’t it the case, though, that Graham took Steve Harrison? He did but I think we had a chance to keep him. Graham didn’t take them, Bassett got rid of them. Watford had been so successful and effectively had a very good product at that time and all of sudden you take away the base. It didn’t quite collapse like a pack of cards but I never felt they were the right sort of people, the ones who came in. Bassett had done a bloody good job at Wimbledon with those guys but Watford was very different kettle of fish. Do you remember the announcement being made? I wasn’t at the RAC club when the announcement was made. But yes, it was a bit of a shock. I thought he made a good signing when he bought Trevor Senior but that didn’t work did it? But on paper that looked like a good one. I think at board level the atmosphere was pretty bleak because Elton and Muff were quite keen on Bassett and Geoff and I weren’t, so we were split. It’s all about the results and performances isn’t it? If the team had done well, we’d have been perfectly happy. If he had been successful we’d all have got behind it but it didn’t get off the ground did it. He had come into something that was totally alien to what he’d been doing before. The supporters didn’t like it, they weren’t keen on the new man were they? Do you think perhaps Bassett didn’t get a fair crack of the whip if people were against him from the start? He could probably make that point but as I said, the supporters weren’t terribly happy were they? You have to feel sorry for Bassett really because he was the wrong man coming in at a very difficult time. But this was just about the only thing Elton did off his own back. Bertie was totally against it too, not necessarily the choice of the man but the way it was done. I don’t know what Bassett was told. Maybe he was told the board was right behind it, but the board knew nothing about it. But let’s be clear here, Elton will probably feel he’d earned the right to make that decision. But it meant that the board was a gimmick. From having a very united board there was this feeling that he’d gone off and done this without consulting anybody. 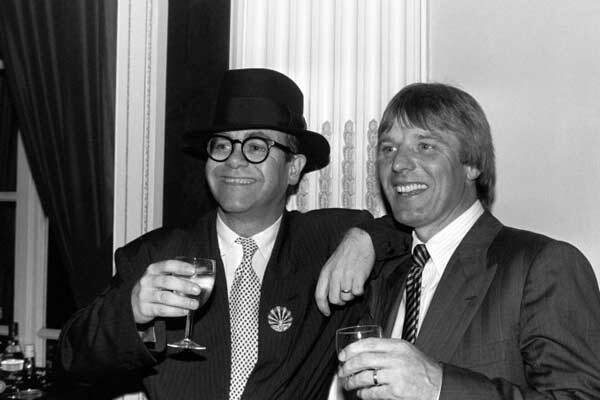 Quite soon after that, Elton was in talks to sell the club to Robert Maxwell. What did you think about that? I remember going to a meeting in London about the Maxwell sale and for a short time we had one of Maxwell’s chaps as chairman. There was a chap from the Mirror Group who came in as acting chairman for a short while while the deal was going through but in the end it all got blocked. It was very unsettling. The team was not doing well. We were starting to worry about relegation. Various of Maxwell’s people were involved. I don’t think I was surprised Elton was selling because it was a question of how long he was going to keep his interest. I remember going to a meeting with Maxwell’s people and Bassett was there and then of course it actually came to nothing. The Football League wouldn’t allow anyone to have a shareholding in more than one club. He already had shareholdings in Oxford and his sons were in charge at Derby but everyone knew who was calling the shots. The Maxwell deal fell through and at Christmas time it was decided that Bassett wasn’t the man. What happened? I seem to remember being at a meeting and we wanted to get back to the family values and Watford of old and we thought, well, shall we take a chance on Steve Harrison? Harrison was a good coach and I think with our support it could have worked but he’s really a number two, rather than a number one. But none of us realised that at the time. Us bringing him in was a bit of a punt, a bit of a hasty thing to do because we didn’t really want to be managerless for too long. We were in the middle of the season and he was someone we knew. We felt that by making that change we gave ourselves a chance to avoid relegation but it was too far gone really. With the benefit of hindsight, what do you think Watford should have done when Graham left? I actually believe we could have done a lot worse than appoint John Ward as manager in the summer of 1987 but we didn’t get the chance. John was excellent managerial material, as he proved with a number of clubs. I think with the support he could have been very good. It would have been a popular decision too. The supporters would have got behind it. Appointing Bassett wasn’t a popular decision. At least Elton did eventually hold his hands up and said he made a mistake. Eventually Elton did sell out to Jack Petchey. I served on the board for a year with Petchey. I came up for re-election in 1990 and I make no bones about it, Petchey and I don’t come from the same planet. I had done 19 years, thoroughly enjoyed it, I never wanted headlines ‘director resigns’ or anything like this, so I just chose not to stand for re-election. Petchey was not my favourite person but he didn’t deserve to have his car scratched, as happened once. Did you have any favourite players? Gosh. I enjoyed Maurice Johnston. Although he was only with us for a year, but what a year. There are too many to mention. I think we had the privilege of seeing so many great teams over the years. We won the Fourth Division and thought, well, how will he improve on that, but he did. Then we went up from the Third Division and thought, it would be nice to establish ourselves in the Second Division. In the early 1970s we had three seasons in the Second Division and I thought if we could better that it would be an improvement. Well, we had three seasons but we went up instead of down. They were a very, very good group of players and you have to give Graham all the credit for that. It’s so important to have a group of players who get on well together. Do any others matches stand out? I remember there was a riot against West Ham once. The away supporters caused a bit of trouble and Eddie [Plumley] and I went to Watford magistrates court on behalf of the club! That sticks in the mind. I also remember the times Elton would arrange board meetings overseas. We had one in Paris, one in Milan and one in Vienna. The following day we had our board meeting then we went to Elton’s concert in the evening. There were so many wonderful experiences. When we went to China in 1983 Elton was in great form. He left Gatwick with 18 suitcases and came back with about 42. He saw the two lions at the entrance to the Forbidden City. He said, ‘I’d like those.’ Well you can’t have them, they said, so I gather he had replicas made. Elton was wonderful. Watford through and through, and we all – because I’m a supporter still these days – should be so grateful that he put his life, soul and, yes, money into the club. If you go back to Graham being appointed in 1977, well you mention Bobby Moore… One morning we picked up the Daily Mail and saw that Bobby Moore was going to be appointed. I don’t really think there was as much in the story as the Mail made out. We were onto Elton very quickly about it, asking whether he really thought he was the right man. Could you see Bobby Moore standing on the terraces scouting a player or watching the reserves? I’ll give Elton the benefit of the doubt on that one, but my goodness, we’re so fortunate we managed to get Graham aren’t we?